A Gift to Savor: $100 for Them, $25 For You! 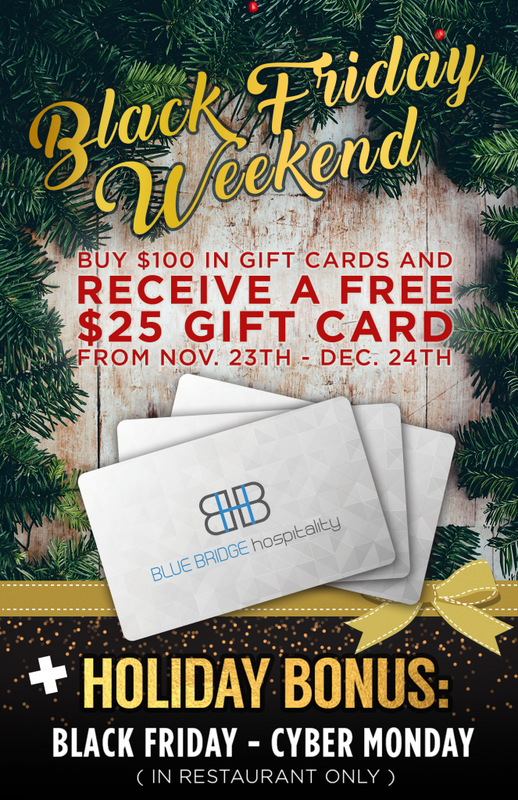 Blue Bridge Hospitality Gift Card Promotion returns on Black Friday! From Friday, November 23rd through December 24th, purchase a Blue Bridge Hospitality gift card of a $100 and get an extra $25! A gift to savor…at over 13 Blue Bridge Hospitality locations. Stop by any of the BBH locations to purchase the gift card, or purchase online at www.bbhca.com. Black Friday through Cyber Monday: Holiday Bonus! Not only will you get an extra $25 for every $100 you spend, but during Black Friday through Cyber Monday 2018, reach into a stocking at each of the Blue Bridge Hospitality locations for an extra “Holiday Bonus,” an additional mystery gift card.